Scientists are now releasing a truckload of results from the probe’s Grand Finale, including six papers out today in the journal Science and five in the journal Geophysical Research Letters. These results tell an incredible story about Saturn. It has a mysterious magnetic field whose poles align nearly perfectly with its rotational axis, for example—that’s weird. And even stranger, its rings pour tons of material, including organic or carbon-bearing molecules, into the planet’s atmosphere. Cassini-Huygens was the much-beloved Saturn orbiter whose life spanned nearly 19 years, including 13 around the ringed world. It revolutionized the way that we think about the planet. It ended its life last year with 22 Grand Finale orbits between the planet’s atmosphere and its rings, where it collected a whole lot of data. The Grand Finale orbits weren’t part of Cassini’s initial plan, Spilker explained, and were done instead of crashing the probe into one of Saturn’s moons (scientists wanted to avoid potentially contaminating a moon with life forms from Earth). We’ve already written about some of the Grand Finale results, including incredible images and observations of Saturn’s perplexing aurora and a glitch in its rings. But this newest batch of data reveals a whole lot more. For example, scientists discovered a belt of high-energy protons between its atmosphere and its rings, according to one of the papers. 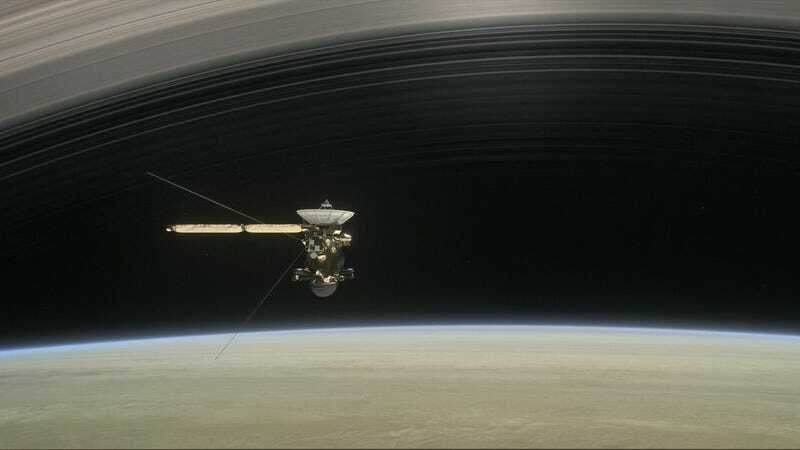 The radiation was so intense that it overwhelmed Cassini’s instruments, but the scientists found a way to use the data anyway, explained Matina Gkioulidou, physicist at the Johns Hopkins Applied Physics Laboratory. “Our method allowed us to reach to some solid conclusions but still left gaps in our understanding,” she said, leaving room for a future mission that will be better prepared to observe these regions. Then there are the new measurements of the planet’s magnetic field taken just 2,550 kilometers above the line scientists use to denote its surface. Researchers confirmed a quirk about the planet, that its magnetic field perfectly aligns with its rotation. And that’s weird. Be it Earth, Jupiter, or Neptune, theoretical models seem to require that a planet’s magnetic field tilts with respect to its spin axis, explained Spilker. “We were hoping we’d see an offset between the rotation and magnetic field axis,” she said. But they didn’t. Perhaps the wildest result, though, was evidence that between the rings and the planet are mostly nanometer-sized dust grains that rain down onto Saturn’s atmosphere—somewhere between 4,800 and 45,000 kilograms of dust per second. Perhaps this means the rings erode over time. Additionally, these dust grains were composed of water and silicates, but also methane, ammonia, carbon dioxide, and more complex organic molecules. This was the first such observation on Saturn of the kinds of molecules that contain carbon and serve as the building blocks of life, though they are not evidence of life itself. “It was a phenomenal surprise to discover the high mass of material flowing into Saturn’s atmosphere and how complex its chemistry is,” research scientist Kelly Miller from the Southwest Research Institute told Gizmodo. Plus, the first confirmed identification of organic molecules in Saturn’s rings demonstrates that these molecules can appear all over the place. “This dataset and the Cassini mission overall have provided an important window into the diversity of environments where organics are present in the solar system,” said Miller. As with any exciting mission, new discoveries yield new questions, so I asked a few folks what they might like to see from a Cassini 2. “I’d look for life in the plume of Enceladus, send a probe into Saturn’s atmosphere, and maybe land something to explore the lakes and seas on Titan carrying the next generation of instruments,” said Spilker. “I also think it would be cool to make movies of ring particles and see how they interact. Bill Kurth, University of Iowa physicist who studied Jupiter’s auroras with Voyager, would also hunt for life on Enceladus. Gkioulidou wanted to see an instrument that could handle higher radiation explore the region of high-energy particles around the planet. As with any good physics experiment, Cassini’s end has pointed physicists towards what they should study next.